It's stupid, but whatever. I'm a girly girl. I'm thankful I'm at a point in my life where I can have a full face of makeup in five minutes or less. I know what works for me and how I like to look. Products left to right: Benefit Erase Paste (concealer), Senna double effects creamline eyeliner palette, Maybelline Falsies mascara (obsessed!! 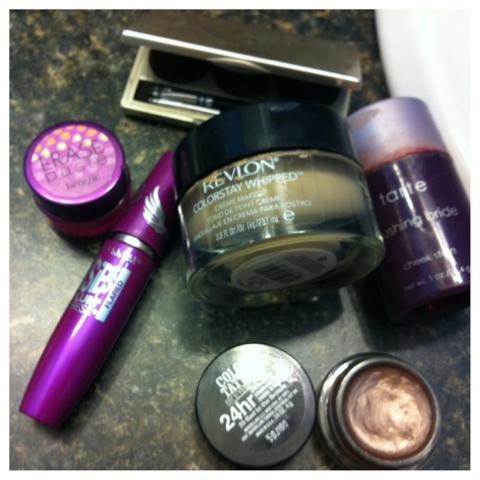 ), Revlon Whipped foundation, Maybelline Color Tattoo eyeshadow, Tarte Blushing Bride cheek stain.